Think twice before you reach out for that cigarette, you might age faster if you are a smoker. Skin ageing due to smoking may be due to increased production of an enzyme that breaks down collagen in the skin. Collagen is the main structural protein of the skin that maintains skin elasticity. The more a person smokes, the greater the risk of premature wrinkling. Additionally tobacco smoke released into the environment has a drying effect on the skin's surface. Smoking also reduces the amount of blood flowing to the skin, thus depleting the skin of oxygen and essential nutrients. Smoking also causes depletion of vitamin C, E and beta-carotene. The body uses these vitamins as antioxidants to destroy the free radicals found in cigarette smoke. 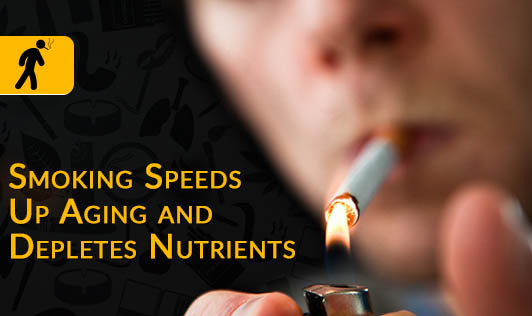 Similarly, smoking depletes the body of B vitamins due to the increased load it puts on the liver's function of filtering toxins out of the blood. Vitamin B12 is used for detoxification of cyanide, which is present in cigarette smoke. Hence, requirement of these vitamins double up in a smoker compared to a non-smoker. To ensure good health, quit smoking and consume a well balanced diet.